Fired vice-president Emmerson Mnangagwa is still holed up in South Africa and isolated despite claims that he is in China, sources said amid indications President Robert Mugabe has ordered that his finances must be closely monitored. Mnangagwa fled Zimbabwe two days after he was fired by Mugabe on Monday for “disloyalty and deceit”. A statement attributed to him threatened that he would return in a few weeks to topple Mugabe, but sources yesterday said far from being in a fighting mood, Mnangagwa was desperate to re-open lines of communication with his boss. The source said the former VP was also being shunned by his business associates, including the Indian owners of the Africa Chrome Fields (ACF). Mnangagwa is said to be with his son Emmerson Junior. War veterans leader Christopher Mutsvangwa, who addressed a press conference in Johannesburg last week and announced that the former VP was on his way to South Africa, promising he would join the opposition ranks, was tongue-tied yesterday. On Friday he promised to answer about 10 questions from The Standard about the Mnangagwa debacle, but eventually delivered two lines before going quiet. “I am focused on the future, not this parochial history. The Mugabe era of monumental misrule is in imminent sunset,” was all Mutswanga could say about the questions, including whether he penned the statement attributed to Mnangagwa or not. Meanwhile, in Harare state security agencies were said to be investigating a number of Mnangagwa’s alleged crimes, including suspected money laundering that could see the once powerful VP being arrested on his return. “The Reserve Bank of Zimbabwe financial intelligence unit has been instructed to keep a close eye on his bank accounts and his business interests because there are fears that he could be funding terror and violence within Zanu PF structures,” a senior government official said. The former VP is said to have interest in sectors such as banking, hotel and leisure, energy, mining and agriculture. 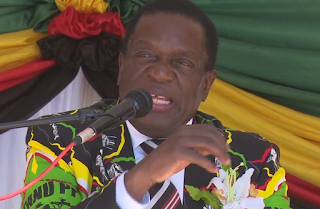 Mnangagwa has allegedly been linked to a case where a local company was using bank transfers to mop up foreign currency in contravention of the Exchange Control Act. The matter was partly investigated by the Zimbabwe Anti-Corruption Commission under RR 27/10/17 but was dropped under unclear circumstances. Companies identified as Europium Star Investments, Spartan Security and Makanaka Investments are involved in the saga. Spartan is owned by Mnangagwa’s close relative, Tarirai David Munangagwa who initially tried to leave the country for Mozambique via Forbes Border Post. Makanaka Investments, also trades as Pote Investments and operates largely in the Zvishavane area, is owned by for former VP’s ally, Antony Clever Pote. The directors of Europium and Spartan are being investigated for allegedly violating the Exchange Control Act by selling money through bank transfers. A Billy Tanhira, who is believed to be opposition leader Morgan Tsvangirai’s late wife, Susan’s brother is also being investigated as part of the case. According to the Zimbabwe Anti-Corruption Commission (Zacc) documents, the matter came to light after two men, Fordias Nyerere and Onesimo Ndoro; accused of converting $100 000 to personal use by Tanhira, who claimed to be the owner of Europium, were arrested for theft of property. Tanhira’s, whose name does not appear on the ownership documents of the company but is the complainant in the matter, claimed Nyerere and Ndoro were supposed to give $201 000 from Makanaka Investments realised from the transfer of $232 000. Nyerere and Ndoro’s lawyers, Bherebende Law Chambers have now written a complaint against the police claiming their clients were being victimised because they were small fish. The lawyers said several transactions of a similar nature where several millions of dollars were sold by Makanaka Investments to several companies including Spartan were conducted through t Nyerere and Ndoro. Sources this was part of many cases that could be used to put Mnangagwa behind bars.